Make Adobo more than the expected in this aromatic version that’s just teeming with delicious savoury flavours. Served as parcels with sticky rice and you’ve got a runaway favourite! Make the marinade by combining the Knorr Liquid Seasoning, vinegar, and pepper in a non-reactive bowl. Pour half of this marinade into a separate bowl. Add the chicken into one of the bowls and marinate for at least 1 hour. Add the garlic cloves and cook until fragrant. Add the marinated chicken and brown. Pour the reserve marinade and the Knorr Oyster Sauce in. Add the water and bay leaves. Let the mixture simmer until the chicken is cooked through, around 10 minutes. Let the dish cool then store in the chiller until ready to use. In a food processor, put the ginger, turmeric, shallots, lemongrass stalks, dried shrimp, chilies, coriander root, coriander leaves, Knorr Chicken Broth, Knorr Pork Broth, Knorr Shrimp Powder, canola oil, coconut milk, and soaked glutinous rice. Puree into a smooth paste. This spice paste may be stored in the chiller for up to 4 days. Place the rice over a drum sieve and cover with cling wrap (another option is to wrap the rice in cheesecloth and place on top of the sieve). Steam for 25 minutes at 100°C. When rice is al dente, transfer to a food pan and set aside. Heat oil in a pan and cook the spice paste until fragrant. Add the coconut milk and simmer for a few minutes. Pour this mixture over the steamed glutinous rice. Scoop 2 tablespoons of the chicken adobo (with some of its sauce) at the center of a banana leaf. Top with 1 cup of the rice mixture, gently pressing down. Fold the banana leaf like wrapping tamales. Repeat with the rest of the rice, adobo, and banana leaves. Arrange the parcels onto a tray (do not overlap). 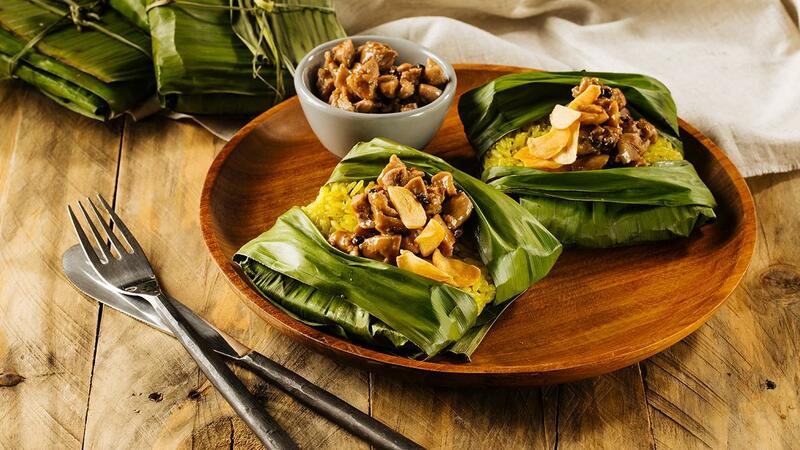 Score the top of the banana leaf parcels to reveal the adobo toppings. Sprinkle with garlic chips and toasted peanuts.